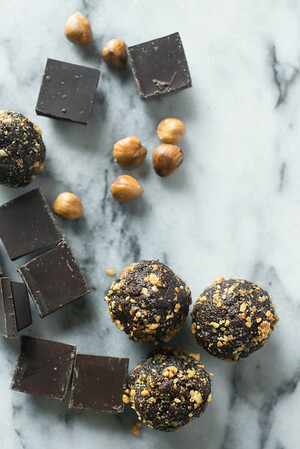 This is a great recipe we found on Cooking Light that uses whole food ingredients to create an indulgent chocolate bite with hazelnut flavor. We love how delicious this tastes without any ANY added sugar. A preschool parent made this for Wendy as a teacher gift and gave her the recipe. We have been HUGE fans of this recipe since. Toast hazelnuts at 350 degrees until browned (about 10 minutes). Once cool, remove any skins. Reserve 20 whole nuts and pulse the rest in a food processor until finely chopped. Set aside. Pulse dates in food processor until they form a paste. Add almond butter and cocoa powder and mix, drizzling in water while processing. Add vanilla and salt and combine. Form into twenty round bites, placing a hazelnut in the center of each. Mixture will feel oily at first. Roll bites in chopped hazelnuts. Store in the refrigerator.